Every decade, a typically popular film comes out which appeals to the teenage girl population. These films all have similar qualities but also feature their own generational spin that makes them instant favourites. In the 1980’s, Molly Ringwald starred in two of them- The Breakfast Club and Pretty In Pink. The 1990’s saw Alicia Silverstone play rich girl Cher in Clueless- a modern day adaptation of Jane Austen’s Emma- while the early 2000’s saw Lindsay Lohan’s character taking on the Queen of the Plastics in Mean Girls. 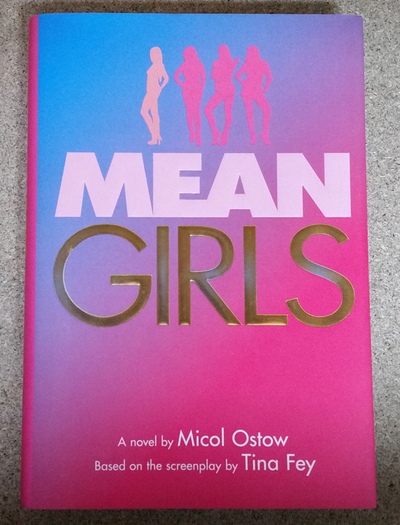 While the film Mean Girls is based on a self-help book for parents by Rosalind Wiseman (Queen Bees & Wannabees) and the screenplay was written by actress comedian Tina Fey, it isn’t until recently- over a decade after the film was released- that a film novelization has been produced. Written by Micol Ostow, the book is a perfect reproduction of the wit and style of the film. Told from the perspectives of several of the key characters, and featuring additional ‘handwritten’ notes, lists and texts between students and staff to push the story along, this novel is perfect for fans of the movie who want to relive the story in book format. For those unfamiliar with the narrative, Cady (pronounced Katie) Heron has recently started attending North Shore High School in Illinois, after being homeschooled for the last twelve years on the African Savannah. With the help of a couple of social misfits- Janis and Damian- she learns to navigate the tricky waters of not only a new country, but an entirely new social environment. Along the way, she learns of the existence of the high school hierarchy- in particular, those at the top, headed by the Queen Bee Regina George- and develops a crush on Regina’s ex-boyfriend Aaron. In typical high-school fashion, it isn’t long before Cady witnesses Regina’s brutal and destructive powers, and she quickly realizes just how corrosive a friendship with the Plastics can be. With a little bit of prompting from Janis, Cady takes on the role of spy (and later saboteur), plotting Regina’s downfall and trying to restore balance to the hallways of the school. But what happens when the ‘role’ that Cady is playing starts to become too realistic? In her efforts to dethrone Regina, is Cady turning into a clone of the very person she is trying to remove from the hierarchy? More than thirteen years after the film was released, the storyline of Mean Girls is still resonant in today’s society. Ostow has reproduced Cady’s story faultlessly- you could almost watch the film in sync with reading her novelized version. Mean Girls, while entertaining, is also an intelligent reminder about the importance of staying true to yourself, and, for people who have not yet seen it, is a perfect introduction to one of Hollywood’s most popular teen films.